I have long been wanting to become more active in conservation, environmental and other animal charity causes. They are all fundamental causes I believe deeply in. It’s hard to find paid work in this area though, unless you have very specific skill set. Just check out the Greenpeace or WWF job ads… so for a long while I found myself demoralised as could not figure out how I could do spend my day doing good in the world, but still pay the bills at the end of the month. So I embarked on a journey, a bit of a social experiment I guess. I wanted to have the ability to live anywhere in the world, travel as needed but also have the time to help others. To this end I’m in the process of re-building my website design business. It allows me the flexibility to live and travel anywhere in the world with a decent Internet connection. My hope is that the business will continue to do well and grow to the point that I’ll be able to take on regular pro bono work for organisations doing good and great things in those key areas I care about. 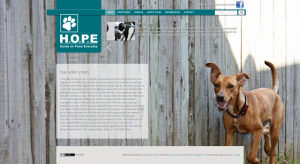 So it’s with particular pleasure that I can announce the completion of the first of these projects, a new website for H.O.P.E – Hands on Paws Everyday. 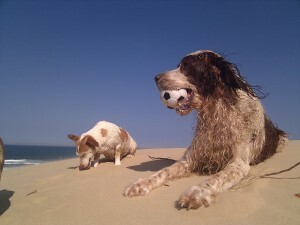 H.O.P.E is an animal rescue charity working in Cape Town and surrounds. The HOPE team are committed to making a lasting difference in the Ocean View and Mountain View areas (South Peninsula, Cape Town, South Africa) both in regard to education in animal welfare and support with regards to donations of food, kennels and general needs to better the lives of abused or neglected animals. We focus on education as well as rescue and have some amazing success stories because of YOUR support. Thank you! Visit the website to check it out and do help if you can with a small donation for this very worthy cause. Sarah from H.O.P.E sent me a lovely message in thanks which I’d like to share. I just needed to drop you a line and say a huge HOPE thank you for donating your time and doing our website for us. Having this website has made us feel more official and people are taking us seriously because its smart, clean, easy to use and looks professional. Thank you so much for the time and patience you spent on getting it just right. Your methods and systems to get us up and running efficiently worked so well and I can honestly say you took all the stress out of this task. I could tick that off on my massive list of to do’s for our launch and know with peace in my heart that you wouldn’t let us down and you didn’t. You just nailed it and we are so grateful for your kind offer and professional service. Thank you thank you thank you. The new website for Arctic Online Website Designers is live now. It’s a focused one page website targeting new clients to drive more business. If you know of anyone looking for a new website or a re-development of an existing site, point them in this direction!